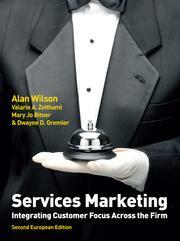 The Second European Edition of Services Marketing: Integrating Customer Focus Across the Firm by Wilson, Zeithaml, Bitner and Gremler uniquely focuses on the development of customer relationships through quality service. Reflecting the increasing importance of the service economy, Services Marketing is the only text that put the customer's experience of services at the centre of its approach. The core theories, concepts and frameworks are retained, and specifically the gaps model, a popular feature of the book. The text moves from the foundations of services marketing before introducing the gaps model and demonstrating its application to services marketing. In the second edition, the book takes on more European and International contexts to reflect the needs of courses, lecturers and students. The second edition builds on the wealth of European and International examples, cases, and research in the first edition, offering more integration of European content. It has also be fully updated with the latest research to ensure that it continues to be seen as the text covering the very latest services marketing thinking. In addition, the cases section has been thoroughly examined and revised to offer a range of new case studies with a European and global focus. The online resources have also been fully revised and updated providing an excellent package of support for lecturers and students.